Over 80 Standard Reports and Powerful Advanced Queries for Calibration Reporting. all of which were designed with SAP software’s Crystal Reports™ making calibration reporting easy. Our standard reports include audit trails, alerts, calibration, loop, equipment reports and more. Reports can be previewed on the screen before printing. The preview functionality allows reports to be used as preformatted controlled queries. This can be a very valuable feature helping to organize repetitive query tasks or establish control over high-risk query tasks. 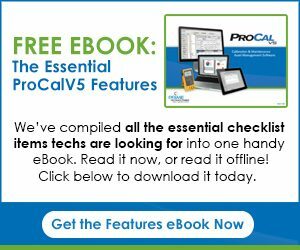 ProCalV5 Calibration Reporting functionality allows Reports to be viewed, printed, emailed, or saved in Excel and PDF formats among others. ProCalV5 standard reports can be modified or custom reports can be created using SAP software’s Crystal Reports™. Modifications can be anything from adding a company logo, to adding additional data fields, signatures, calculations, etc., to a complete reformatting. Custom reports can be created for any purpose in your calibration reporting work flow, such as printing labels, business metrics reporting, to special work assignment querying. 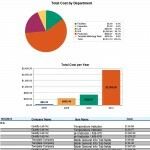 Create and Modify Your Own Reports Too! 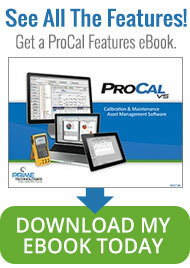 Make full use of your ProCalV5 solution and customize your own reports! Using SAP Crystal Reports software, users can create, add or modify any report for customization to their solution. More than 80 are standard and an unlimited number of other customized reports can be made to your exacting specifications. Examples for both are shown below. This report shows all alert priority maintenance items that are currently pending. This report shows all Instruments, Test Instruments, Systems and Loops, calibrated within a specified period of time that had at least one as-found value that was outside of its high or low spec limit. This report shows all Instruments, Test Instruments, Systems and Loops that failed calibration within a specified period of time. This report shows a listing of all Instruments, Test Instruments, Systems and Loops calibrated within a specified period of time that had test point readings that were Found outside of the established control limits. Note that even if an item’s “As-Left” value(s) were corrected to within the established control limits, it will still appear on this report. This report shows a listing of all Instruments, Test Instruments, Systems and Loops calibrated within a specified period of time that had test point readings that were Left outside of the established control limits. 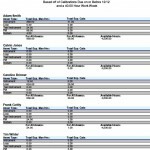 This report shows all additions and changes made to the System for a specific record type (i.e. MASTER INSTRUMENT, LOOP, TEST INSTRUMENT, even PCREQUIRED FIELDS and APPROVAL POLICIES, etc.) It displays the dates and times at which activity occurred and the name of the person who was responsible. This report gives a recommendation on whether to decrease, increase, or maintain the current calibration frequency for any item record. It uses a specified number of Calibration records to make this analysis using the A3 method, given the target reliability and interval change confidence percentages. This is useful for optimizing efficiency of your calibration schedules. The report displays the Observed Reliability and Observed Out of Tolerance Rate for the most recent calibrations, using the space between the Calibration Dates to determine the Average and Longest observed intervals. This is a completed calibration report for Instruments showing some master information, results of the calibration (calibration specs plus as-found and as-left values and deviation percentage), and Test Instrument(s) used. This is a good report to choose for those Instruments whose calibrations are fairly simple, those with test points that remain consistent with regard to stated accuracy, accuracy percentage and resolution since this information is summarized at the top of the report. This is also a completed calibration report for Instruments, although this report shows more detail than the one previously described. This is a good report to choose for those Instruments whose calibrations are more complex. It includes the same information as the other calibration report, but instead of summarizing the stated accuracy, accuracy percentage and resolution at the top of the report, it displays this information for each test point individually. This report shows an analysis of a single Instrument calibration. A line graph is included so that you may easily compare the expected, as-found, and as-left values for the calibration. This report allows you to trend an Instrument’s maximum deviation over a specified period of time. A line graph is included so that you may easily view this information. Standard calibration label comes with all ProCal products. Includes, Asset ID, Date Calibration was performed, Next Date Due, and who Performed Calibration. This is a completed calibration report for Loops showing some master information, results of the calibration (calibration specs plus as-found and as-left values and deviation percentage), its comprising Instruments, and the Test Instrument(s) used. This is a good report to choose for those Loops whose calibrations are fairly simple- those with test points that remain consistent with regard to stated accuracy, accuracy percentage and resolution since this information is summarized at the top of the report. This report shows an analysis of a single loop calibration. A line graph is included so that you may easily compare the expected, as-found and as-left values for the calibration. This report allows you to trend a loop’s maximum deviation over a specified period of time. A line graph is included so that you may easily view this information. This is a completed calibration report for Systems showing some master information, results of the calibration (calibration specs plus as-found and as-left values and deviation percentage), its comprising Instrument(s), Loop(s), Test Instrument(s) and/or System(s) used. This is a good report to choose for those Systems whose calibrations are fairly simple- those with test points that remain consistent with regard to stated accuracy, accuracy percentage and resolution since this information is summarized at the top of the report. 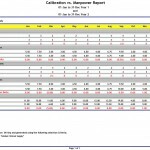 This report shows an analysis of s single System calibration. A line graph is included so that you may easily compare the expected, as-found and as-left values for the calibration. This report allows you to trend a System’s maximum deviation over a specified period of time. A line graph is included so that you may easily view this information. 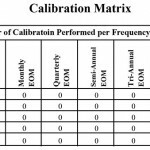 This is a completed calibration report for Test Instruments showing some master information, results of the calibration (calibration specs plus as-found and as-left values and deviation percentage), and the Test Instrument(s) used. This is a good report to choose for those Test Instruments whose calibrations are fairly simple- those with test points that remain consistent with regard to stated accuracy, accuracy percentage and resolution since this information is summarized at the top of the report. This is also a completed calibration report for Test Instruments, although this report shows more detail than the one previously described. 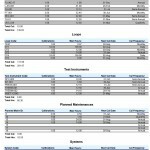 This is a good report to choose for those Test Instruments whose calibrations are more complex. It includes the same information as the other Test Instrument calibration report, but instead of summarizing the stated accuracy, accuracy percentage and resolution at the top of the report, it displays this information for each test point individually. This report shows an analysis of a single Test Instrument calibration. A line graph is included so that you may easily compare the expected, as-found and as-left values for the calibration. This report allows you to trend a Test Instrument’s maximum deviation over a specified period of time. A line graph is included so that you may easily view this information. This is a report that shows all of the master information for a Test Instrument, with the stated accuracy, accuracy percentage and resolution information for the calibration test points summarized at the top of the report. This is also a report that shows all of the master information for a Test Instrument, however it is more detailed in that the stated accuracy, accuracy percentage and resolution information are displayed for each test point individually. This report shows all Instruments, Test Instruments, Systems and Loops that were calibrated by a particular Test Instrument during a specified period of time. This report looks similar to the Test Instrument Report (spec summary) except for the fact that it has blank lines on which to write the as-found and as-left values for the Instrument’s calibration. It also has an area in which to document the Test Instrument(s) used, comments and whether the Instrument passed or failed. You can print out worksheets for all Instruments due for calibration within specified period of time and give them to your technician to complete on the job. This report is similar to the other Test Instrument worksheet except for the fact that it lists the stated accuracy, accuracy percentage and resolution for each individual test point, as opposed to summarizing this information at the top of the report. It has an area to record the Test Instrument(s) used, comments, and whether the Instrument passed or failed. It has blanks lines to record the stated accuracy, accuracy percentage and resolution for each individual test point. This report lists all Test Instruments that will be due for calibration within a specified date range. Worksheets for all Systems due for calibration within a specified period of time and give them to your technician to complete on the job. This report shows the User IDs and Names of all users who are currently logged onto ProCalV5. This report shows all user logon activity (with exact time stamp and Log Details: successful logon, invalid user ID and/or password attempts, forced log offs, time expired, etc..) recorded within a specified date range. This report shows all Instruments, Loops and Test Instruments due for calibration and all SOP’s that have expired within a specified period of time, for all companies entered into the system. 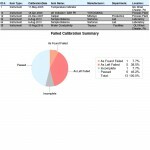 This report shows all Instrument, Loops and Test Instruments due for calibration and all SOP’s that have expired within a specified period of time for the current company. This report shows the Report General Information, Event type, status, entered by, etc… As well as Action Taken, Item Details and Signatures for this particular Report. This report can be printed for each document record entered into the system for the current company. It shows all of the information entered for a document including the procedure, description, objective, scope, and summary. On the Document Report Parameters Tab, the specific Document Number and Revision Number must be specified. This report lists all documents that will expire within a specified date range. This is a report that shows all of the master information for an Instrument, with the stated accuracy, accuracy percentage and resolution information for the calibration test points summarized at the top of the report. This is also a report that shows all of the master information for an Instrument, however it is more detailed in that the stated accuracy, accuracy percentage and resolution information are displayed for each test point individually. This report looks similar to the Instrument Calibration Report (Spec Summary) except for the fact that it has blank lines on which to write the as-found and as-left values for the Instrument’s calibration. It also has an area in which to document the Test Instrument(s) used, comments and whether the Instrument passed or failed. You can print out worksheets for all Instruments due for calibration within a specified period of time and give them to your technician to complete on the job. This report is similar to the other Instrument worksheet except for the fact that it lists the stated accuracy, accuracy percentage and resolution for each individual test point, as opposed to summarizing this information at the top of the report. 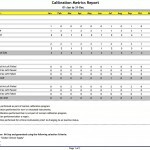 This report lists all the Instruments that will be due for calibration within a specified date range. This report shows a list of all Instruments entered for the current company. The following fields from the Master Instrument Record are displayed on the report: Instrument ID, Description, Manufacturer, Model Number, Serial Number, Last Cal Date, Next Cal Due, and Status. This report shows a list of all Loops entered for the current Company. The following fields from the Master Loop Record are displayed on the report: Loop ID, Description, Manufacturer, Last Cal Date, Next Cal Due, and Status. This report lists all PM items entered into the system for the current company. The following fields from the PM Record are displayed on the report: PM ID, Item Code, Item Type, Maintenance Type, Description, Last Date, Next Date. This report shows a list of all Systems entered for the current Company. The following fields from the Master System Record are displayed on the report: System ID, Description, Manufacturer, Model Number, Serial Number, Last Cal Date, Next Cal Due, and Status. This report lists all Test Instruments entered into the system for the current company. The following fields from the Master Loop Record are displayed on the report: Test Instrument ID, Description, Manufacturer, Model Number, Serial Number, Last Cal Date, Next Cal Due, and Status. This is a report that shows all of the master information for a Loop, with the stated accuracy, accuracy percentage and resolution information for the calibration test points summarized at the top of the report. This is also a report that shows all of the master information for a Loop, however it is more detailed in that the stated accuracy, accuracy percentage and resolution information are displayed for each test point individually. This report looks similar to the Loop Calibration Report (Spec Summary) except for the fact that it has blank lines on which to write the as-found and as-left values for the Loop’s calibration. It also has an area in which to document the Test Instrument(s) used, comments and whether the Loop passed or failed. You can print out worksheets for all Loops due for calibration within a specified period of time and give them to your technician to complete on the job. This report is similar to the other loop worksheet except for the fact that it lists the stated accuracy, accuracy percentage and resolution for each individual test point, as opposed to summarizing this information at the top of the report. This report lists all of the Loops that will be due for calibration within a specified date range. 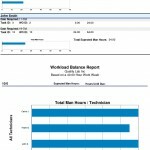 This report shows details of all work order tasks completed within a specified date range (one task per page). 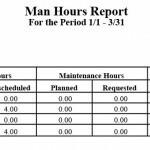 This report shows details of all work orders completed within a specified date range (one work order per page). This report includes worksheets for all maintenance requests due within a specified date range (one work sheet per page). This report shows details of all maintenance results completed within a specified date range (one maintenance result per page). This report shows a list of all open work orders (work orders that have not been completed). This report includes worksheets for all PM items due within a specified date range (one worksheet per page). This report shows a list of all planned maintenance items that are due within a specified date range. This report shows a list of all requested maintenance items that are due within a specified date range. This report includes worksheets for all Work Orders due within a specified date range (one worksheet per page). This is a report that shows all of the master information for a System, with the stated accuracy, accuracy percentage and resolution information for the calibration test points summarized at the top of the report. This is also a report that shows all of the master information for a System, however it is more detailed in that the stated accuracy, accuracy percentage and resolution information are displayed for each test point individually. 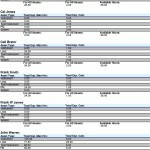 This report looks similar to the System Calibration Report (Spec Summary) except for the fact that it has blank lines on which to write the as-found and as-left values for the System’s calibration. It also has an area in which to document the Test Instrument(s) used, comments and whether the System passed or failed. 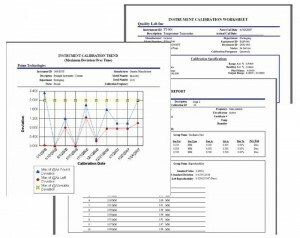 You can print out worksheets for all Systems due for calibration within a specified period of time and give them to your technician to complete on the job. This report is similar to the other System worksheet except for the fact that it lists the stated accuracy, accuracy percentage and resolution for each individual test point, as opposed to summarizing this information at the top of the report. 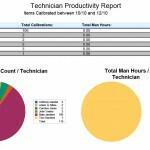 This report lists all of the Systems that will be due for calibration within a specified date range. 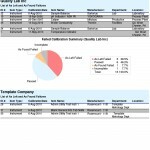 This report gives you an overview of all the options on the Company record as well as what the user has and has not selected. Also User Variable Definitions that were added, User List Definitions, User Label Definitions and Required Field Settings. This report gives you an overview of all the System Default Values and Settings that are available and what the user has selected or if they haven’t selected options. This report gives you an overview of all the List items as well as what the user has added to the system. 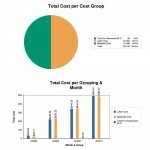 This report gives overviews of all the User Groups that were created and per each group the options that were selected.